I would pay good money to see the reaction of that Blue Moon-loving friend if he sampled this thrilling expedition to Southeast Asia in stout form from the innovative folks at Ballast Point, in Beer Paradise (also known as San Diego County). A friend recently mentioned this beer as his favorite beer, but recommended it with a warning. It’s epic. Indeed, it is a beast, but one where if you’re looking for a flood of spice sensations, you’ll enjoy immensely. It’s not exactly a food pairing beer since the intense flavors will cover up just about anything. It’s far from a session beer, perfectly served at 7 ounces by this bar because the owner feels nobody would really want a pint of it. No samples either because too many would wimp out. 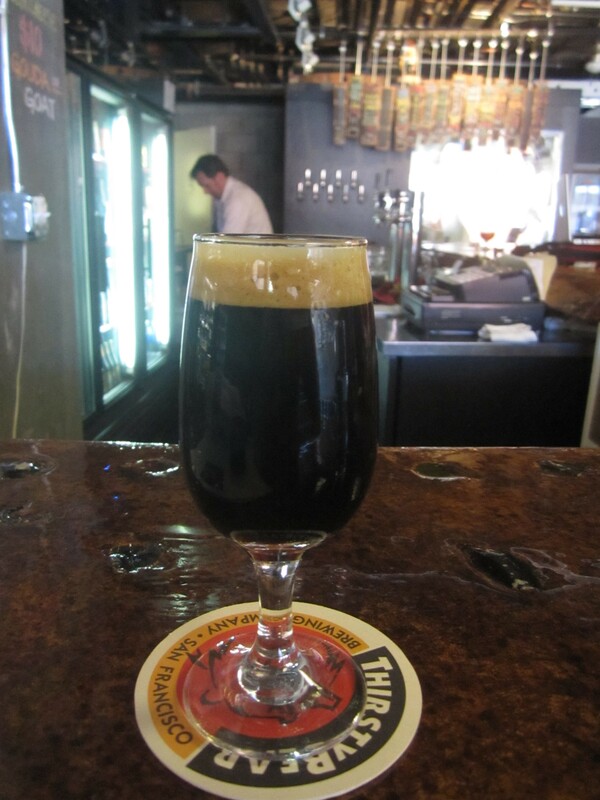 It’s a stout with a healthy body, not too thick despite the cacao bean hue (light night sky) and creamy head. 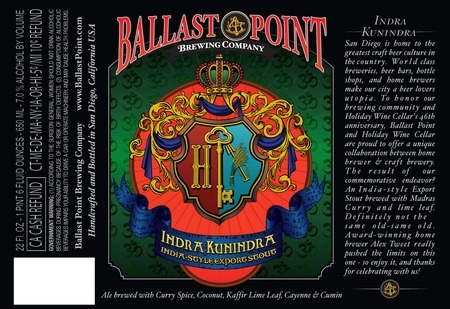 Get your pencils ready, the Indra Kunindra was originally brewed in 2011 with a home brewer in San Diego, and comprises of madras curry, cayenne pepper, kaffir lime leaf, cumin, and toasted coconut. First, the curry notes control the nose. The initial taste is numbing of cayenne pepper, similar to the Szechuan pepper corn’s “ma la” sensation. Curry spice then sweeps through, complete with the lingering kaffir lime leaf dominating the finish. It reminded me of Andy Ricker’s Thai cooking up in Portland, Oregon at the Pok Pok restaurants I (and the rest of the world…) adore, where bold spicing is not restrained, but everything comes together with purpose pushing you to the edge. It’s all shockingly smooth and the finish is actually even refreshing. You’ll want water, but a fire hose isn’t needed. It’s a thriller, alright. But it’s nothing compared to the far too hot Habanero Sculpin IPA from Ballast Point. Indra Kunindra is a brilliant display of brewing finesse and creativity. It’s hot, it’s absurd, it’s a trip. You’ll even want a second round. This entry was posted on October 18, 2012 by trevsbistro. It was filed under Beer of the Week .